Dehydrate seaweed by soaking in water for 7 minutes. Then drain the water. Mix the rice vinegar, tamari soya sauce, Asian sesame oil and garlic together. 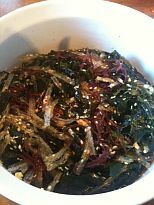 Pour over seaweed salad and mix together. Add red peppers and sesame seeds on top.